Even though it had only been open a few minutes the car park and store were already full. Despite this we managed to get everything we wanted and a few more things besides! That was when we discovered the problem! Asda had evidently forgotten to bring any staff in to operate the checkouts! It was bad enough that there were trolleys and pallets all over the store given they’d had since 4pm to re-stack the shelves. We joined the shortest queue we could find just before 1am and it was gone 2 when we finally left the store! Oh well at least it’s done! Just before we went to bed at 3:30 I got an e-mail from Amazon advertising a Frank Zappa CD – under the advert was a note to say that the CD would be posted from Australia and wouldn’t arrive in time for Christmas! You don’t say! I made a Tunis cake this morning but when it came out of the oven it hadn’t risen very much. So I decided to try again only this time I used the electric whisk instead of just beating/mixing by hand. However when it came out of the oven it was, marginally worse! So we decided to stick the two bits together!!! 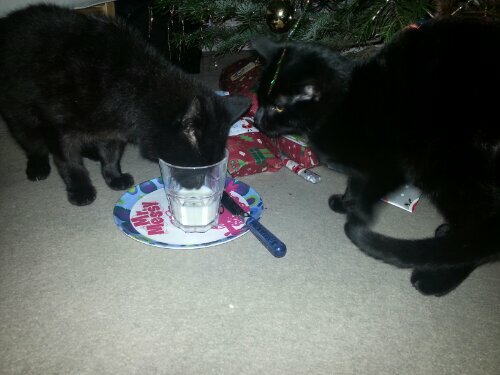 Ben left a glass of milk under the tree for Santa and as soon as he’d gone to bed there were two furry noses (and paws) in it!